St Enoch Subway station is a tale of two platforms, two sets of escalators and two sides of Glasgow. 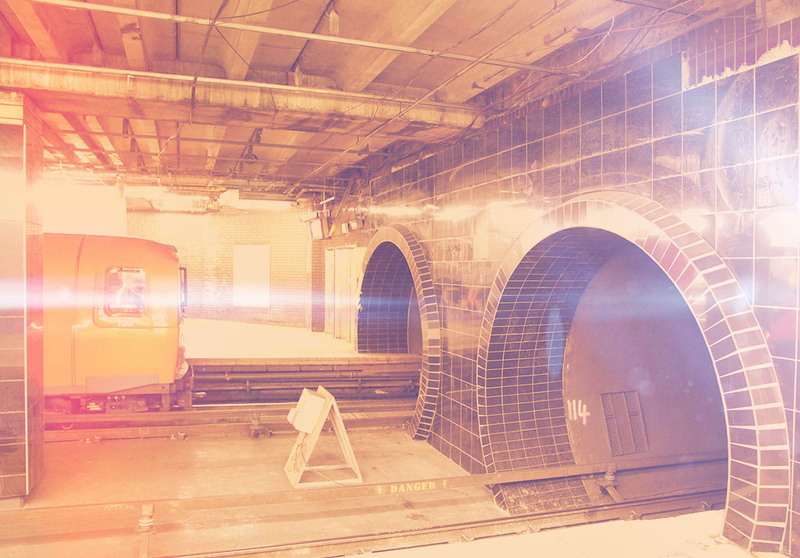 It is one of the biggest stations on the network with two distinct platforms serving each circle. It is important to pick the right circle for your direction of travel before you head through the ticket barriers, as it’s a one shot deal. If you pick the wrong side, you will have to come back through the barriers and it may mean another charge. The escalators are in pairs beyond the ticket barriers, with the left side going down and the right side coming up. In times of repair or renewal this may change, so be prepared to have to clamber down the escalator unpowered if need be. It can be a tight squeeze. The platforms themselves are a somewhat strange experience. The two platforms face each other, so there is a definite temptation to have a scan across the opposing platform. The large pillars that stand between the rail lines also add to the sense of distance. Over the years, I have witnessed the rather unusual spectacle of drunken locals conducting a very public conversation with their mate across the platforms many a time. All in, the distance, the pillars and the generally murky middle section, make it a very unusual and cramped viewing spectacle. 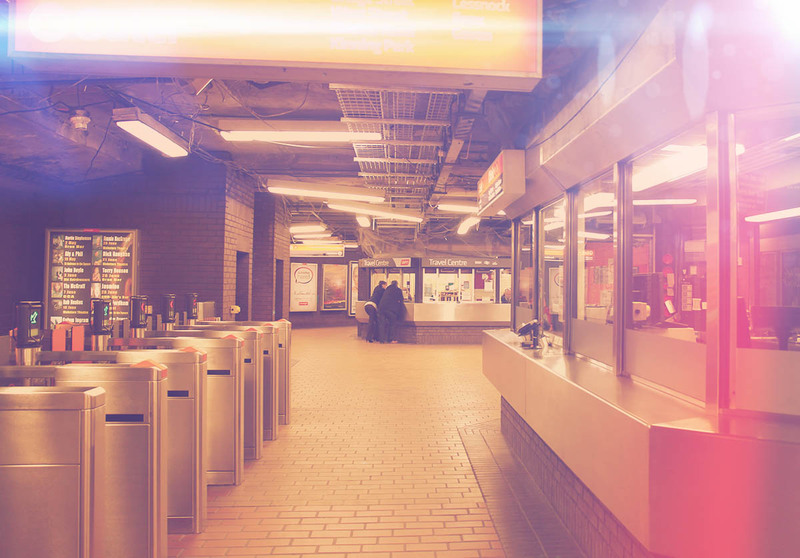 On the main concourse of the station stands the main ticket office and machines, with the two sets of barriers leading off to the two separate platforms on either side. The station itself has recently undergone a vast upgrade, but we decided to leave our old photographs up for posterity (or at least until we can get a new set of photo’s). The modern version has been stripped bare and now looks like something out of a Stanley Kubrick movie. The busiest and most obvious entrance to St Enoch Subway station, is from the Buchanan Street / Argyle Street entrance which leads up a large set of glass covered escalators. The impressive rise is met by one of the busiest pedestrian junctions in Glasgow, namely the junction of the pedestrian Buchanan Street and the traffic restricted Argyle Street. 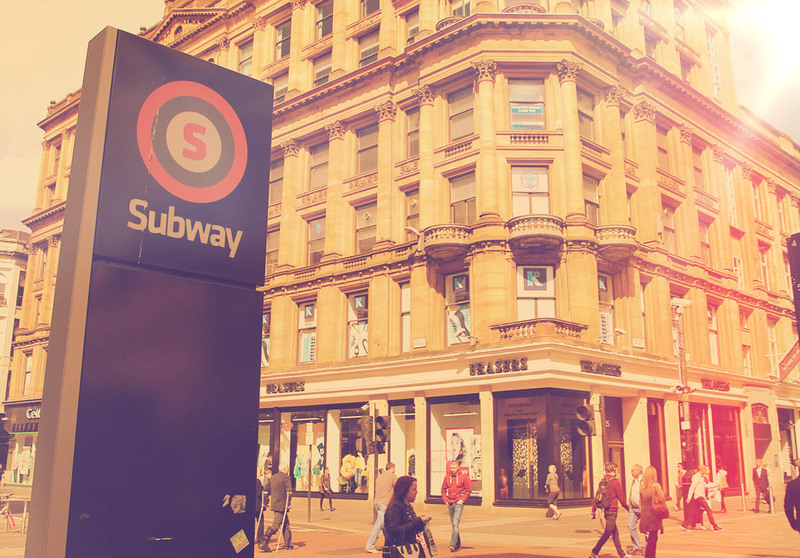 Together with Buchanan Street station, which can just about be seen in the distance, it provides the main shopping area of Glasgow. Immediately outside the station sits the St Enoch shopping centre. The facility is a large covered retail shopping mall and offers a host of big name brands, as well as an ice rink and car park. Despite playing second fiddle to Buchanan Galleries, the St Enoch Centre offers a capable alternative with the advantage of not being at the top of a massive hill. Across the road from the main glass covered entrance is Fraser’s department store and further up is the exclusively posh Princes Square. Argyle Street neatly crosses the end of Buchanan Street, on the one side leading to Central Station, the Hielemans Umbrella and the International Financial Services District. The opposite direction leads to a nice run of pedestrian mainstream shopping (TK Maxx, River Island, Mark’s and Spencers) before heading off to the Merchant City, Trongate and finally the Gallowgate. 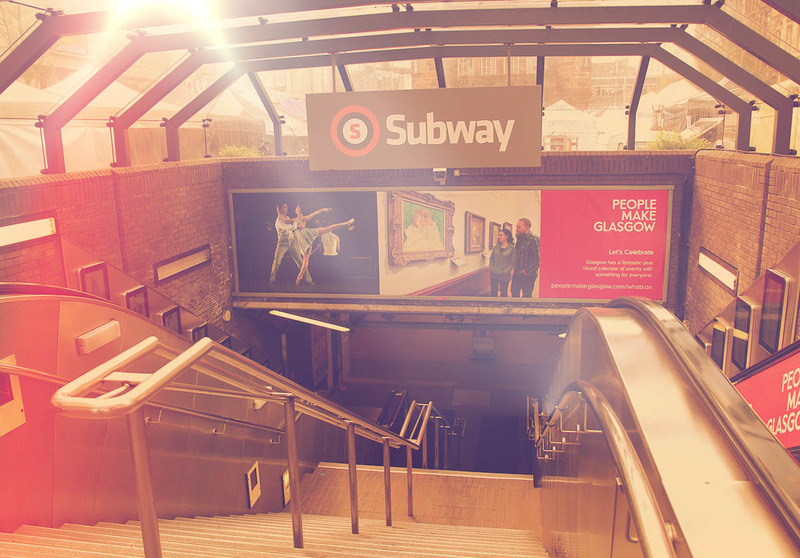 The second entrance to St Enoch Subway station is at the opposite end of the station. This entrance leads on to the quieter side of St Enoch Square and further on to the river, with it’s bridges and classical cobbled waterfront. It’s actually a very nice view at night when it’s all lit up. Significant work has been done on the waterfront in recent years to make it a modern river based area. It is probably worth mentioning at this point that while St Enoch very much continues the luxury and opulence of Buchanan Street, you are never very far away from the less flashy areas of central Glasgow. The area beyond Central Station, heading west down Argyle Street, is now the International Financial Services District. Most of the local Glaswegians still refer to it as Anderson though, the concrete clad bus station and general area term that is still synonymous with the Red Light district. During the day, it is all flash suits and business lunches but late at night the seedier side of Glasgow comes out to play. Likewise, the progression in the other direction along Argyle Street starts first with the very respectable Merchant City but gradually moves beyond it towards Trongate and High Street. Beyond that, the Gallowgate and the Barras market area offers a more earthy and authentic Glaswegian shopping experience. At weekends, there is a large and very famous market there that has various stalls and entertainments. It’s a long way from the style and sophistication of a continental market but still a good day out rummaging around in the weird and wonderful stalls. It’s low rent but it’s fun. The other major role played by St Enoch Subway station is to service Central Station. The railway station is the main terminus for the West Coast main line to London and can be accessed from under the unique structure that is the Hielemans umbrella. Just exit the subway station, turn left and keep going. When it gets dark just follow the signs for Central Station, you can’t miss it. You should pass through the fast food epicentre of Glasgow at the Union street junction and it is a few minutes walk under the bridge so just keep going. If you come out at the other side of the Hielemans umbrella then you have gone too far. Subcrawlers normally assemble outside Times Square which is just on the right if leaving the quieter entrance to the station. Don’t be limited to just going there however, as there is Hootenanny’s on the other side of the square as well. If you hipsters want something a bit less old man, Sloan’s is down the alley on the opposite side from Fraser’s, just outside the main station entrance. Saying that, it is Glasgow’s oldest bar. By far the biggest decision for subcrawlers is deciding which way to go round. Traditionally, most people do the southern first clockwise route so they can finish the Rangers pubs before it gets late. If you are doing a less than serious crawl then the northern anti-clockwise route has the better pubs. Many a fantastic crawl has died a death at Partick and been no worse for it. 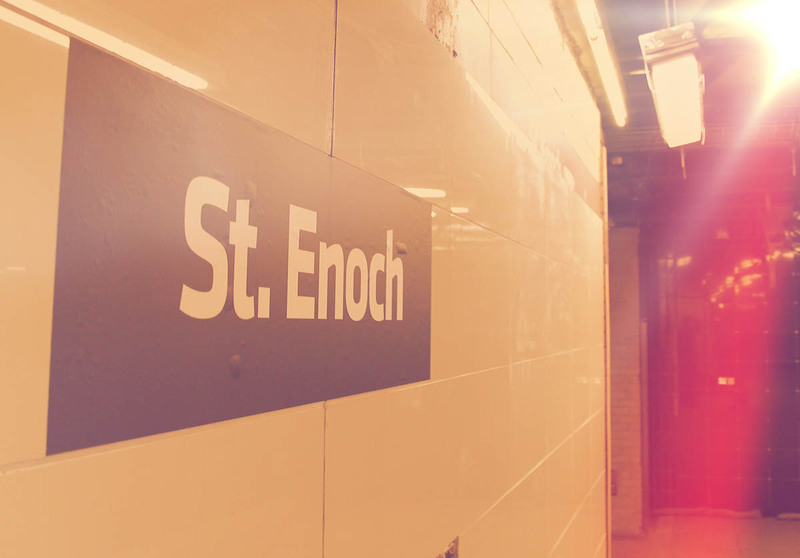 On the whole, St Enoch is among the busiest on the network and covers the southern end of the Glasgow City Centre. 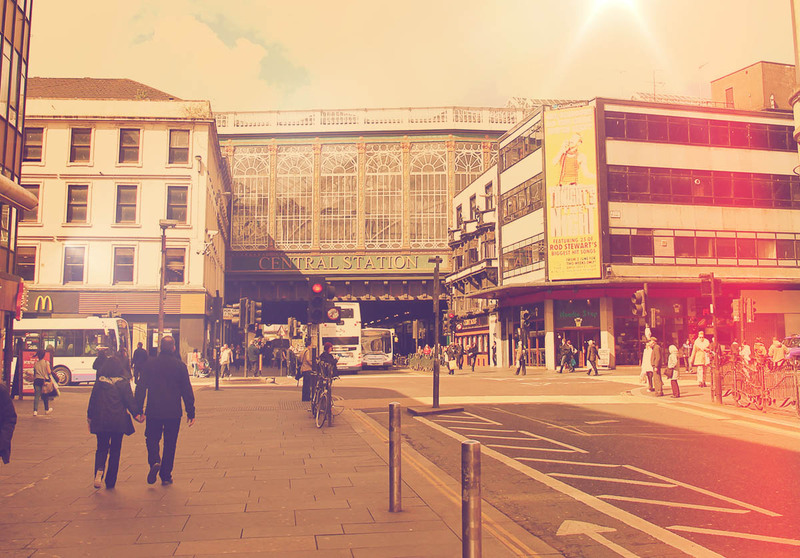 With Buchanan Street, it is one half of the main city centre stations on the network.